While testing an integration, debits and credits didn’t add up. Then I noticed all the the debit amounts have decimal places on the source file but not in GP. I looked at the options for the Debit and Credit fields in the Distribution mapping, there was no option to Not Round. I opened up a ticket with Microsoft, and Lucas Miller from Microsoft support showed me a simple fix but its very not obvious. In IM, Go to the Source Properties window by double clicking on the Source, Go to Columns tab, make sure the field that's mapped to your Debit or Credit (whichever one has the rounding issue) has Currency for Datatype as shown in the screen shot below. Mine had Long Integer originally so after I changed to currency and click Apply and OK issue was resolved. We could get back to him fast enough over the weekend, but he was able to figure it out on his own. I was finally able to get it to work by setting Excel as a default program for the file types. Over the years certain people in my family have accused me of being lazy. I’m not going to name names but I would imagine it is easy to guess who the accusers might be for those of you who are similar in nature to myself. My counter argument is I’m just efficient. Why do things that aren’t necessary? Why not do things the easiest way possible? I’m not sure if what I’m going to show you is necessary or even efficient but I thought it was a fun solution to making sure budget numbers are even on an Excel spreadsheet before importing into GP. A client came to me with a problem: After importing budget numbers where a total number is divided by twelve to get even numbers throughout all periods this leaves a decimal place on each individual period. When the number is not divisible by twelve GP doesn’t have whole dollar amounts in the total because each period is only allowing for two decimal places. For example, the numbers circled above all have infinitive decimal ranges and when they imported, because the decimals were cut off at two digits, the totals come out not in whole numbers. Here’s the solution we came up with. We copied over the spreadsheet to a new worksheet and made the budget numbers a fixed two decimal places. This made the totals go off by around four cents higher or lower for the total. 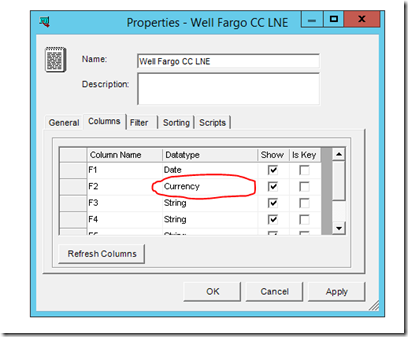 Column Q has a nice little formula that rounds off the total (column P) to whole numbers and Column R give a new value we replaced Period 12 numbers with. These formulas were in the Q10 and R10 cells. This took a little Excel work but since we could drag down cell references it was way easier than manipulating the period twelve numbers manually. Now the real confession: Some of you may be saying to yourself “I thought you said you were efficient (Lazy)?” You’re right, It would have taken me a very long time to figure out these formulas myself (or even at all). What I really did was pass this over to my developer and he figured it out for me. There is no special Canadian Halloween (unlike Canadian Thanksgiving, Independence Day, Remembrance day, Family Day etc.) but my recollection is that most of the people we trick or treated to were quite open to our Canadian culture when we announced it was Canadian Halloween. If they didn’t have candy we said we’d take canned soup or any type of food. I don’t think we had to go shopping that week and we met a ton of girls. Although I’m sure most of the girls we met decided that they would never date a Canadian after meeting our motley crew. What does this have to do with opening back up a bank reconciliation after it has already been posted? 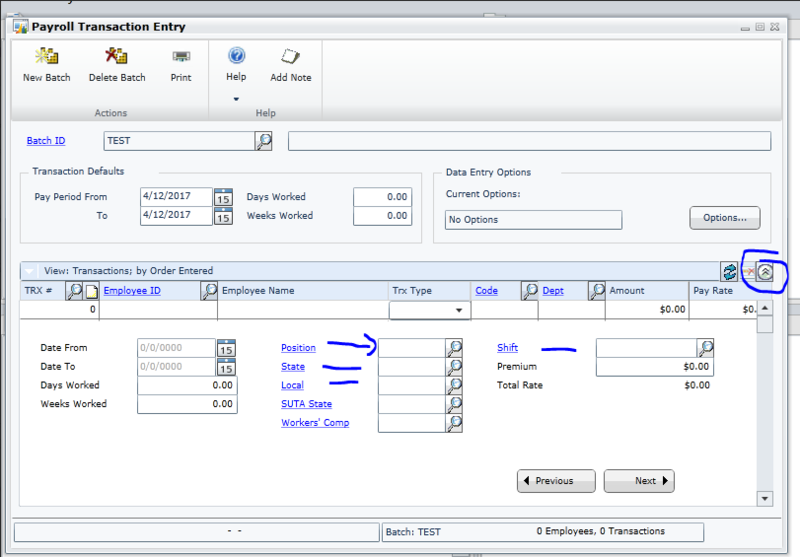 I’m going to discuss a method below that some of our consultants use to open back up a bank reconciliation. You can believe me without question or you can test this out first on a test company. 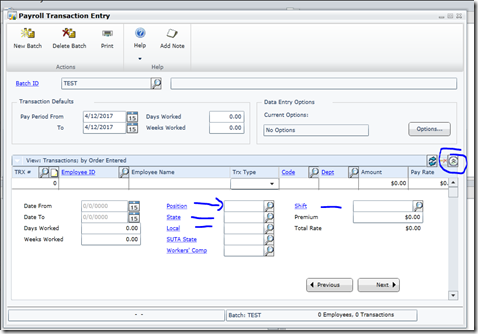 Although I’ve told anyone that asks for the past several years that you can’t unpost a bank reconciliation that’s not entirely true. The above method works great. It just takes a little SQL knowledge and you can be re-reconciling in no time. But don’t just take my word for it. I once swindled a whole apartment complex out of all their precious chocolates and candy. 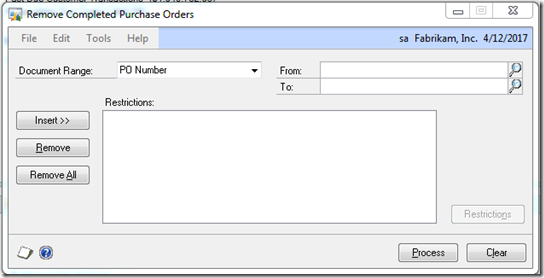 A client wanted to email purchase orders out of GP using their modified POP Purchase Order Blank Form. Everything worked fine no errors, except the email never got sent or received even though GP gives the message that email has been sent. Also the purchase order prints fine without issues to the screen and to the printer. Thanks to Microsoft Support for this solution. First of all, try switching the Alternative Modified Form back to Original Report and then try the email again. 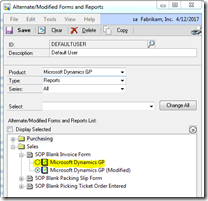 If it works, then your modified report needs to be adjusted. 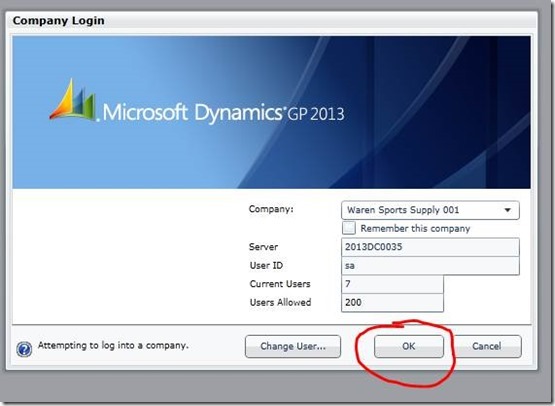 To do this, log into GP with poweruser access, click on Administration, under Setup click on Alternate/Modified Forms and Reports follow the screen shot below then click Save. 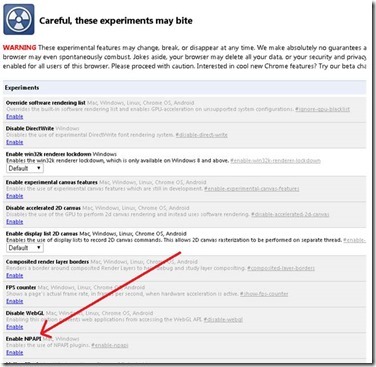 Now test your email again, if it works then your modified report needs more fixing. 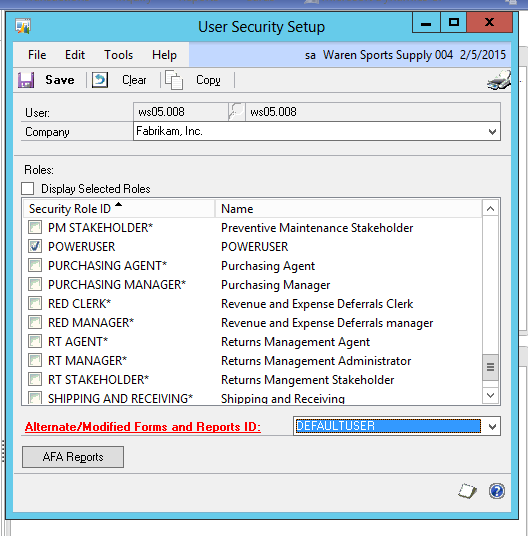 Open up your modified report in Report Writer. 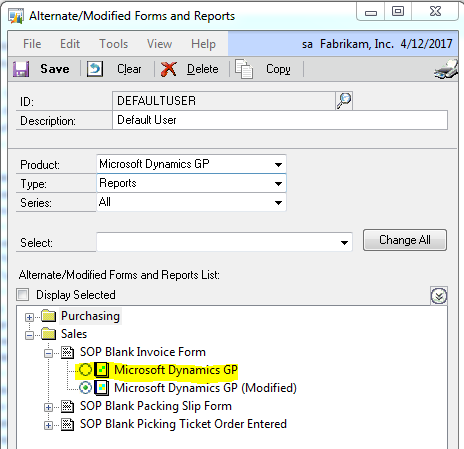 Click on Microsoft Dynamics GP>>Tools>>Customize>>Report Writer, select Microsoft Dynamics GP and select OK, click on Reports menu, look up your report on the right panel, double click then click on Layout to open it up. Check your Section Option’s window. 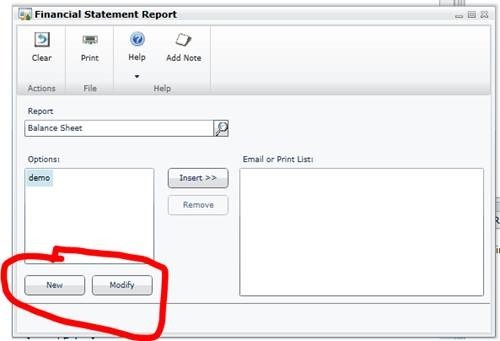 Click anywhere on the layout of the report, click on Tools menu>>Section Option, select PO Header and select Open. 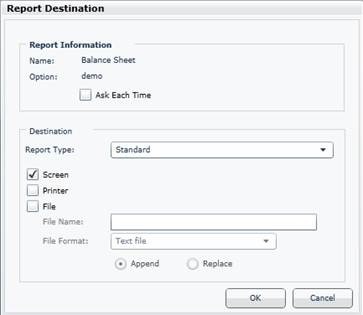 Go through each report section and mimic the settings that are on the original report.The easiest way to do this is to have two report writer windows up side by side so you can compare and make the necessary changes. Save your changes, revert back to Alternate/Modified Forms and Reports to the modified report and test your email again. It should work. Although issue should have been resolved already in SQL 2008R2 SP1RU4 I still received this with later versions. 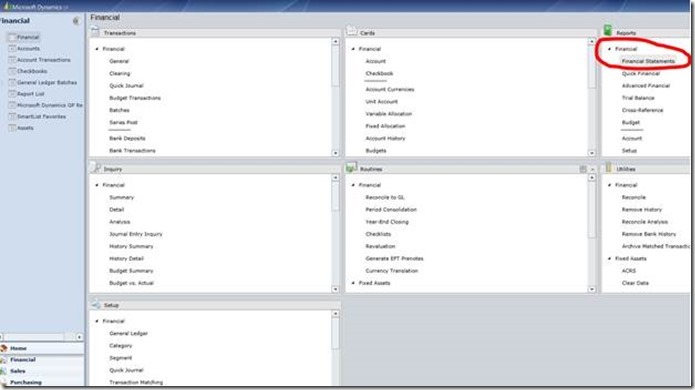 Method 1: Open up Sql server management studio and change tracking on each of the tables below. GL00100, GL00102, GL00200, GL00201, GL10000, GL10001, GL10100, GL10101, GL12000, GL12001, GL20000, GL30000, GL32000, GL40000, GL40200, MC00200, MC40000, MC40600, SY00300, SY40100, SY40101. Right click on the table>>Properties>>Change Tracking, Click on Change Tracking on the right side of the window, change from False to True, Click OK.
Repeat this for all tables. If after running the above scripts and issue still persists, then there might be other tables that you need to change tracking on. The best way to find this is to open up the Data Mart Integration logs. 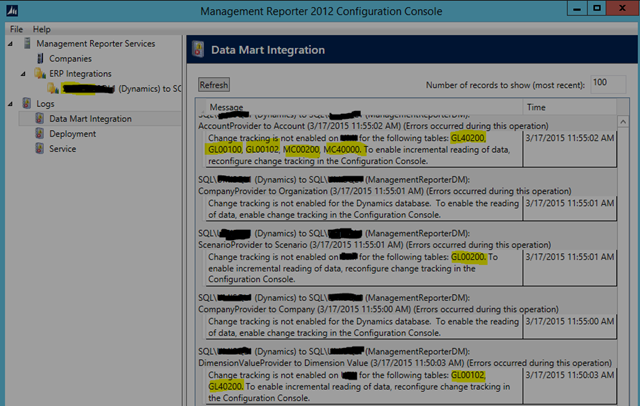 Open Management Reporter Configuration Console, on the left panel under Logs, click on Data Mart Integration. 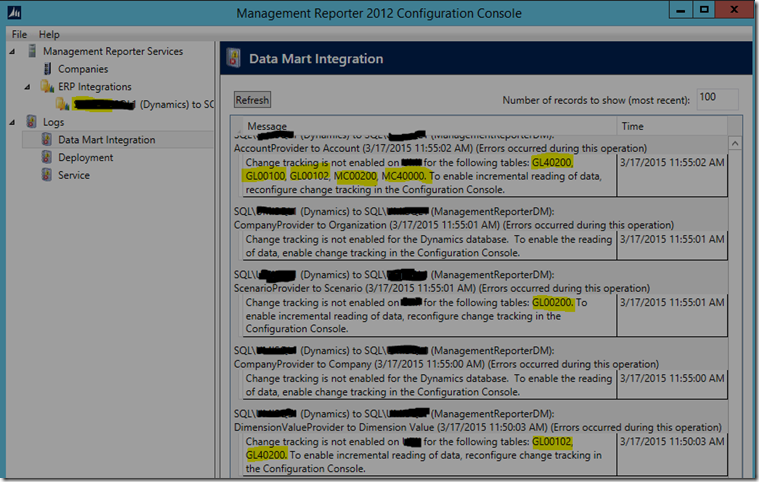 Go through the logs on the right side of the window to find out what other table you need to change the tracking on. This Blog Post is taken from documentation written by Steven Loflin of Georgia Regents University for classroom instruction. Thanks for detailing this out for everyone Steve. The purpose of this document is to provide instruction on how to re-enable the Microsoft Silverlight plug-in in the Google Chrome Web Browser. Starting with Chrome version 42, Google disabled the Netscape Plug-in API (NPAPI), which is used by the Silverlight Plug-in. Consequently, those students using Google Chrome 42+ may run into an error when logging into DynamicsCloud, and be asked to install Silverlight (again). 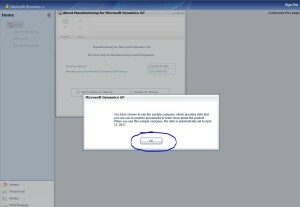 If a student follows the steps to download and reinstall Silverlight, nothing will happen and the same message will appear again when trying to log into DynamicsCloud. 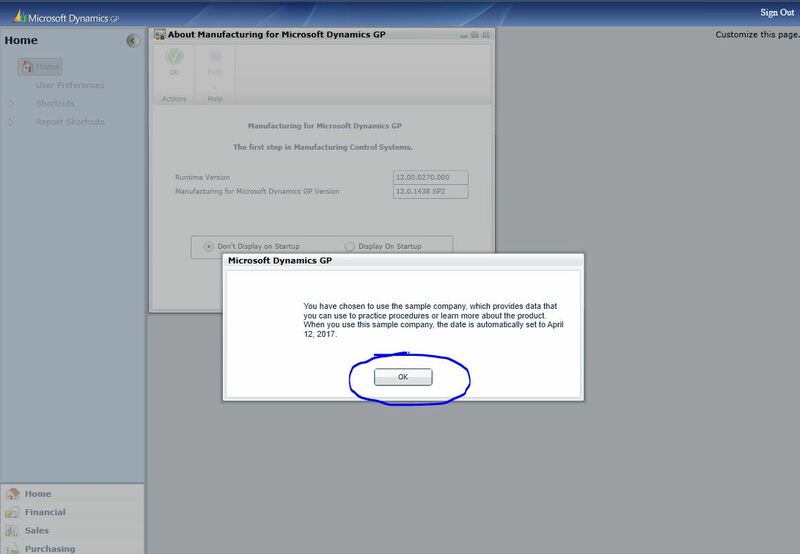 Before proceeding, it is recommended that you try using either the Mozilla Firefox or Internet Explorer web browser to continue your work in Dynamics Cloud. Although the text recommends Google Chrome for Windows PCs, other students have communicated that they have used Firefox and Internet Explorer to complete the project with no issues. The steps below use the chrome://flags feature in Google Chrome. The flags function allows enabling/disabling functionality in Chrome. If used incorrectly, the flags function can render your Chrome browser unfunctional. Therefore, please follow all instructions below exactly as listed. Step 1: Open your Chrome web browser and type: “chrome://flags/” in the address bar. Press the [Enter] key. Step 2: The screen below will open. Look for the experiment “Enable NPAPI” and click the blue “Enable” hyperlink below it. 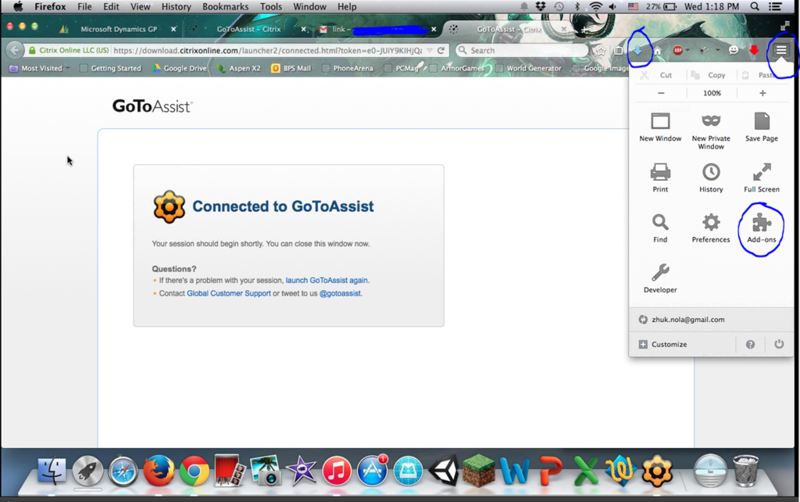 Step 3: You will see the “Enable” hyperlink change to “Disable”. NPAPI is now re-enabled in Chrome. Step 4: Close Google Chrome and restart your computer. 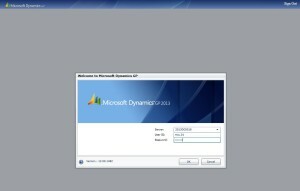 Step 5: Open Google Chrome and log in to Dynamics Cloud. The Silverlight plug-in will now run normally. Use the Extender fields in 3 different calculated fields involving rounding and IF statements within in IF statements. To make it more fun, calculated field 1 is referenced in calculated field 2 and so forth. Solution 1. Pull 2 Extender Fields to display side-by-side on a report Follow this article to pull the 2 Extender fields then drag/drop and format them onto the report. http://support.microsoft.com/kb/935385. Here’s what my calculated expression looked like for one of the extender fields. 2. Use the 2 Extender fields in 3 different calculated fields involving rounding and if-statements within another IF statements. To make it more fun, calculated field 1 is referenced in calculated field 2 and so forth. Here’s the formula in simple English: IF Ext. 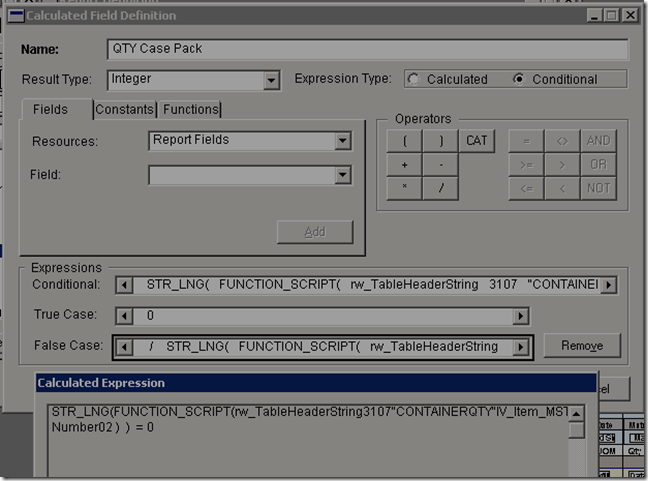 Field Case <=0, then put 0; otherwise, do (QTY Allocated / Case Pack) rounded Here’s how it looks in report writer: Here’s what it says in the False Case box: SOP_Line_WORK. 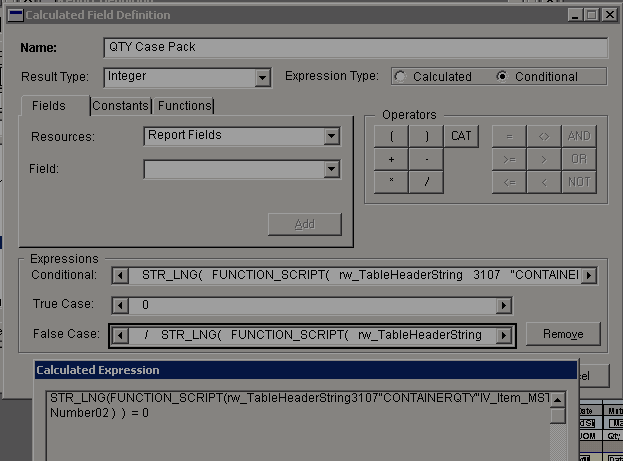 QTY Allocated / STR_LNG(FUNCTION_SCRIPT(rw_TableHeaderString 3107 '”CONTAINERQTY” IV_Item Number 0 2))) Some key things to remember: 1.Result Type for Extender fields always have to be String 2.When you reference an Extender filed in a calculated field -Convert the extender field to an integer utilizing one of the STR_Integer functions -Result type always have to be with a currency or an Integer. 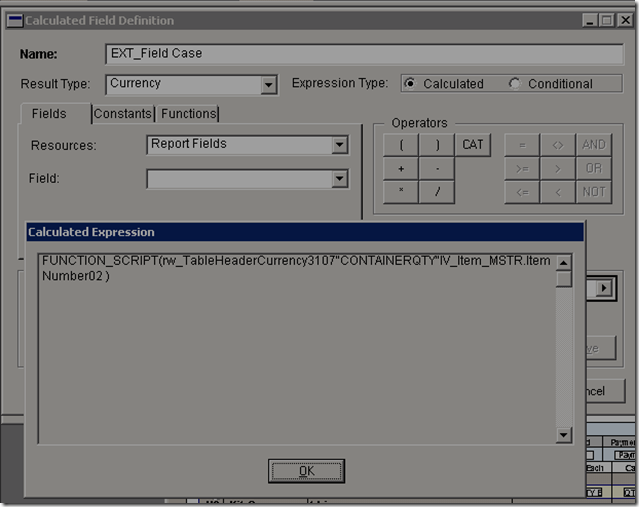 -If you need to reference this calculated field in another calculated field, then make sure that your Result type is Currency GOOD LUCK! It’s getting hard to find all the blog posts I once did a long time ago. I need these things so I don’t have to figure everything out again. Here is a post I have used often in the past. I often have the request to get all the journal entries for a particular period of time. Usually this request comes from auditors. You can export the GL detail report but formatting is usually an issue. You can export all the transactions from a Smartlist (account transactions) but that usually takes a long time if you want the data for a long date range, say 6 months to a year. Here is a script I’ve used in the past to export the data straight from SQL. It includes the user who posted the transaction and the actual date it was posted on. You will have to change the bolded red date and year for your particular needs. 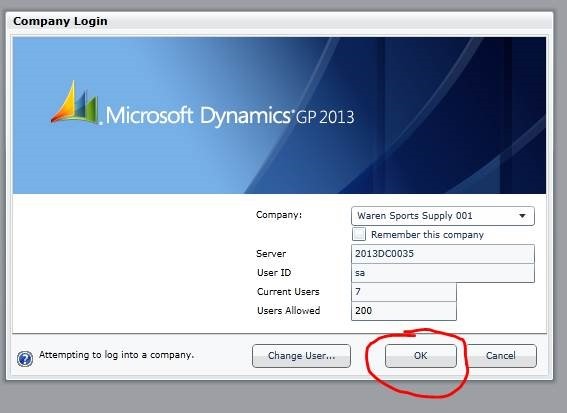 You will also need to add GL00100.ACTNUMBR_X to include however many account segments you have in your GL account. 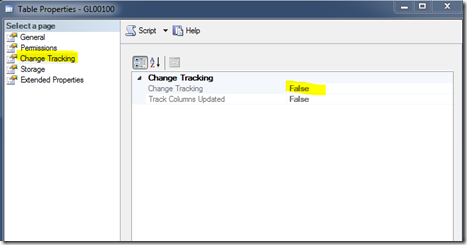 When running the query in SQL have the output results set to file. Note this is for open year transactions. If you want data from a historical year, find and replace the table from GL20000 to GL30000 and OPENYEAR to HSTYEAR. I had this happen to me again and ran across an old blog post I did years ago. A lot of people think I just blog so I can live the rich and famous lifestyle but in all honesty it’s because I have a bad memory and I know I’m going to come across issues like this again. I don’t usually like posting on break/fix type issues. It’s pretty hard making GL_Account_MSTR posts entertaining and most of the usual Dynamics headaches are documented on the knowledge base or someone else’s blog. But for some reason I couldn’t find this error anywhere. So instead of giving you the answer right off I need to at least tell a story to make this a little more interesting. Most of the time I work directly with our clients to fix a wide range of issues. Over the weekend our CEO came in to work but was met with a whole litany of errors when running reports in Dynamics. Dealing with a client is one thing but I always feel added pressure to resolve issues quickly when dealing with the big boss lady. Hoping to impress I jump into action thinking maybe, just maybe, if I do this right I can secure a pay raise or something. Much to my chagrin not a single soul has posted about this error. I did find posts of similar errors and one was from my most trusted and famous Steve Chapman. After a bit of hymning and hawing I dusted off the cobwebs from way before the weekend and remember our most excellent payroll guru applied the new HIRE Act update for payroll to our own system late last week. Now, my number one rule for doing any type of update or upgrade is torecreate the reports.dic file. It never fails (well, at least 50% of the time) Reports.dic gets corrupted. Don’t even say it David Musgrave. I know you are right about shared reports.dic files. I’m still waiting to hear about that pay raise. I ran this recreation process for the customer and it solved all of her problems. I’m not kidding. Every problem she had in life was gone. It’s amazing what recreating the reports.dic file can do for you. It even solves memory problems so I’m told. I think I’ll try it on my system to see if it helps me gain some richness and famousness. Heck, I’d settle for my memory back. This FAQ sheet is intended for students but professors may find this useful as well. Please read the initial chapter in your book for detailed instructions on this. 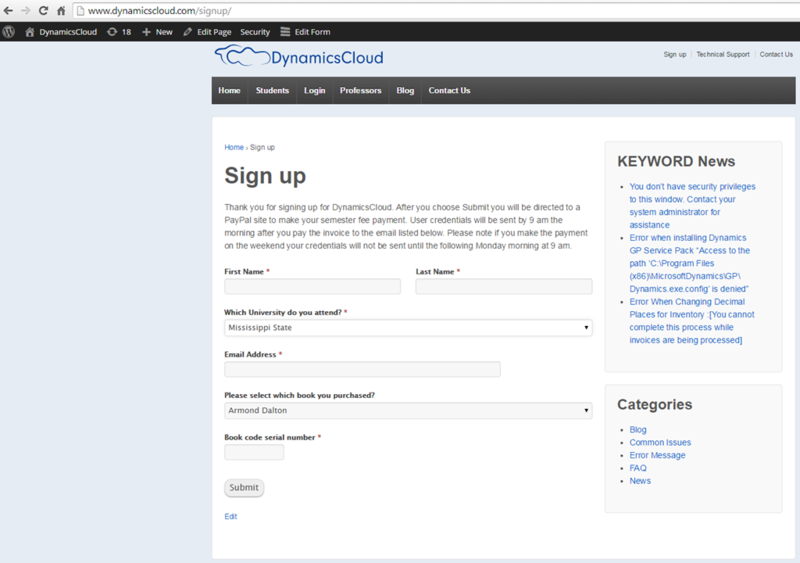 In summary navigate to www.DynamicsCloud.com and choose the Signup. You will be taken to the signup sheet where you should enter your Name, email address, University and book publisher. If you choose No Book you will be directed to a PayPal page where you will be asked to pay for a semester hosting fee. If you’ve purchased a book you should not pay anything extra as the hosting fee is included in your book cost. The book code serial number can only be used once and after submission you will receive your login credentials by email by 9 am PST the next working business day. 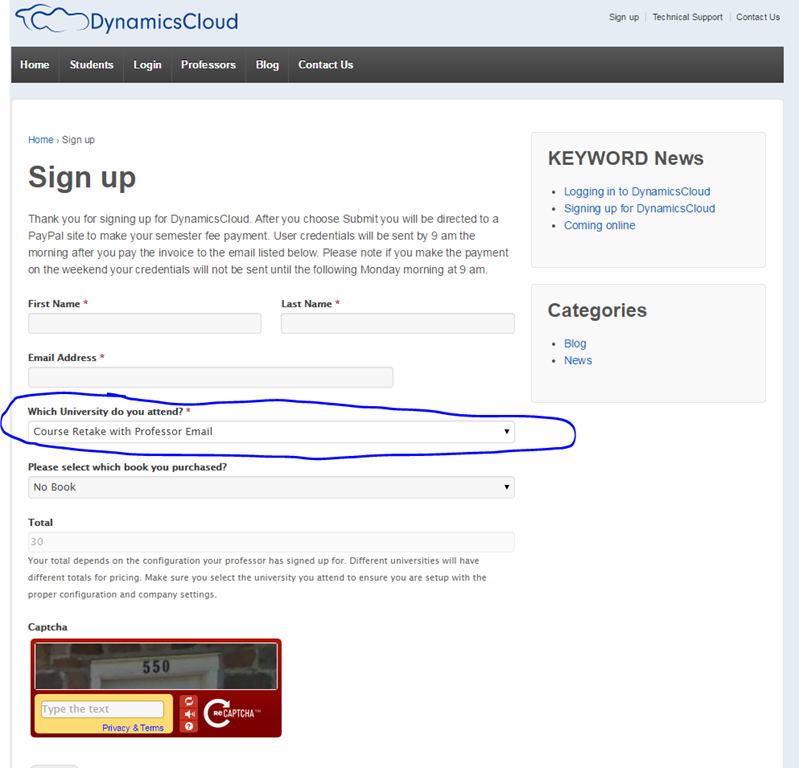 Please email support@dynamicscloud.com if you do not receive an email within that time frame. 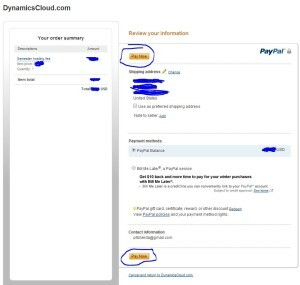 You can go to www.dynamicscloud.com and choose login or you can go directly to https://dynaa.dynamicscloud.com/GP/Views/LogOn.aspx. You will have two login credentials. The first login always has a dynamicscloud\ in front of the user name where the second login is just the user name. An email will be sent outlining credentials and login instructions after submitting the book code serial number on the front of your book. This usually means your internet connection is too slow to reach the server. If you are on a wireless internet connection try plugging in with an Ethernet cable. We often see this where classrooms have everyone connected via wireless or at homes with slow internet connections. Another common issue with slow internet connect includes some kind of variable of error like the following. The error itself is kind of pointless and the only thing you can do is to X out of the browser. Try connecting via an Ethernet cable to see if performance improves. 7. Should I create a new session or connect to an old session? In most cases you should select Create a New Session. You will be asked in GP to view your current sessions where you can delete your old session and reenter the company as desired. If you get an error when you try to navigate around the GP system (Sales homepage for example) you should log out and try creating a new session. 8. 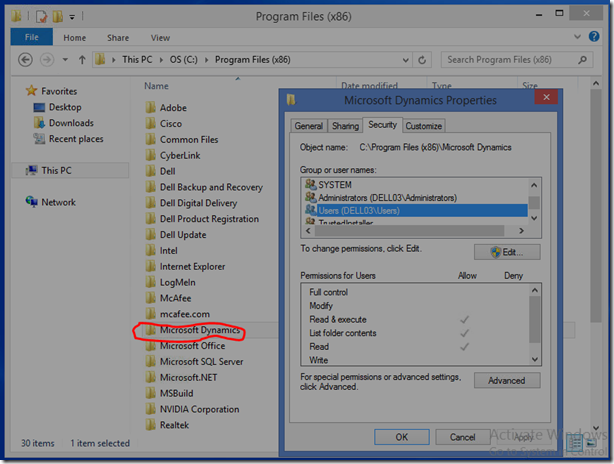 How do I properly log out of DynamicsCloud? 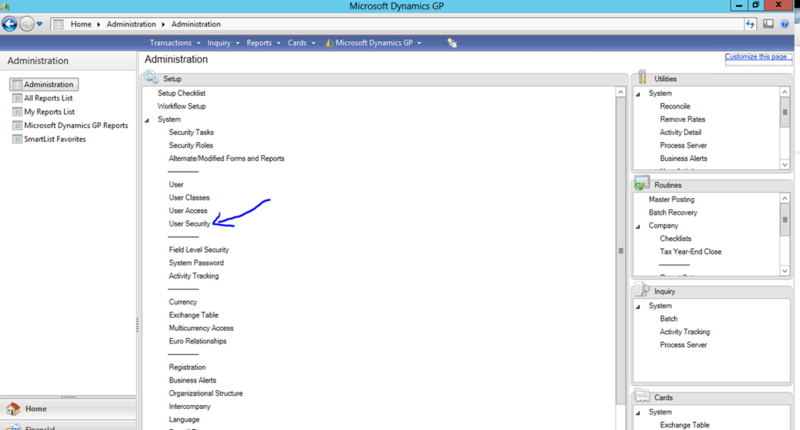 If you don’t want stuck sessions you should use the Exit GP option at the top right of your window as shown below. This often occurs when the user ID is not entered correctly. Common variation are a space at the front of the user id (caused from copying and pasting in the username incorrectly) or a / instead of a \ between dynamicscloud\username. 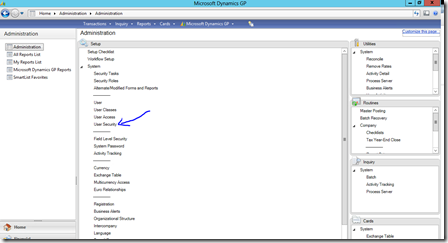 Example – incorrectly putting in dynamicscloud/username will not work. It needs to be a backslash. Spelling the user name incorrectly is another common thing that will cause this error. Example – dynamiccloud\username wont work. 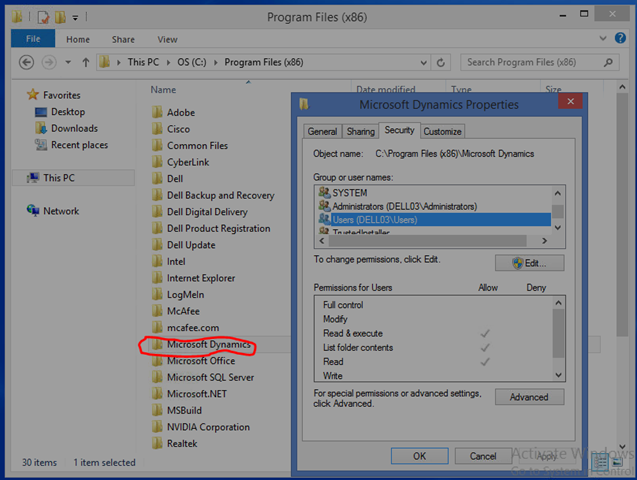 Neither will dynamicsclouds\username will not work. We’ve seen some students have workstation issues. Try clearing your browser history and deleting temp files. Enable Silverlight if you haven’t already. 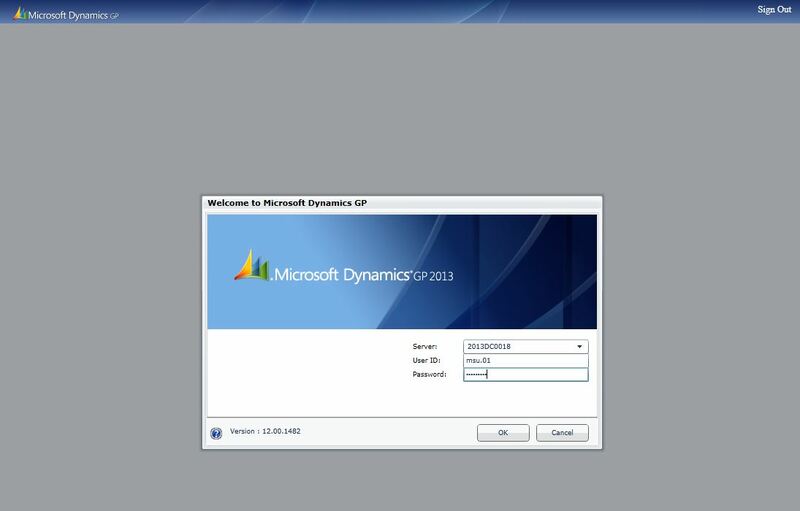 Otherwise email support@dynamicscloud.com and we will refresh the GP Session Services. Your initial password will always be the same but you can change your second password (login to GP). Navigate to Home page>>user preferences>>password. 11. How do I start over? 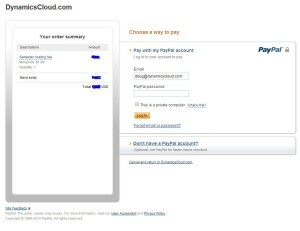 Choose the database restore option and when you choose submit it will prompt you for a $10 restore fee through paypal. You will then need to let us know what your user ID is so we know which database to restore. 12. What if I don’t have a PayPal account? 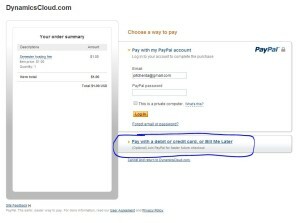 You can pay with a debit or credit card by choosing the option “Don’t have a PayPal Account?” as shown below. 13. Can I sell my book after I'm done with it? No. The book validation code can not be used more than once. 14. How do I contact support and what are the support hours? Email support@dynamicscloud.com. Office hours are 5:30 am PST to 5 PM PST. Please email support and we will do our best to respond during the same day as the support request is generated. 15. Can I use my Mac? Yes. 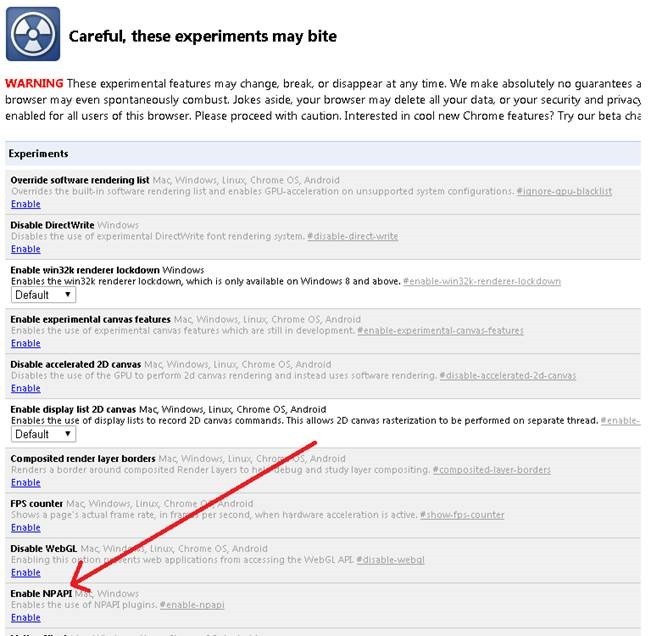 Please use Firefox with Silverlight enabled. More details - You will have to download and install Silverlight (click on blue down arrow as shown in screenshot below and install Silverlight). 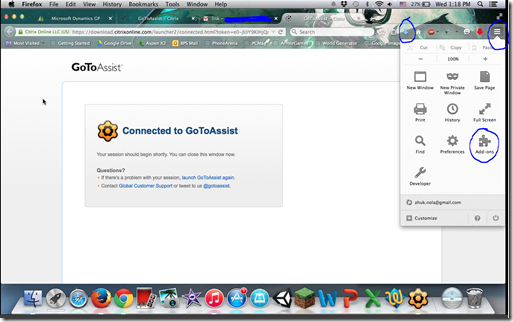 After Silverlight is installed click on the tools button at the top right hand of the screen and choose Add-ons. Go down until you see Silverlight and choose Always Activate. 16. 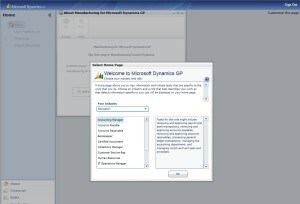 Can I use Dynamics with my own business ventures? You cannot use this service for your own personal business. You can contact sales@dynamicscloud.com if you would like to discuss hosting fees for your own business venture. Typical monthly hosting fees are anywhere between $165 –$300 per user per month. You read that right. Students get a screaming deal to learn Dynamics in an academic setting. 17. 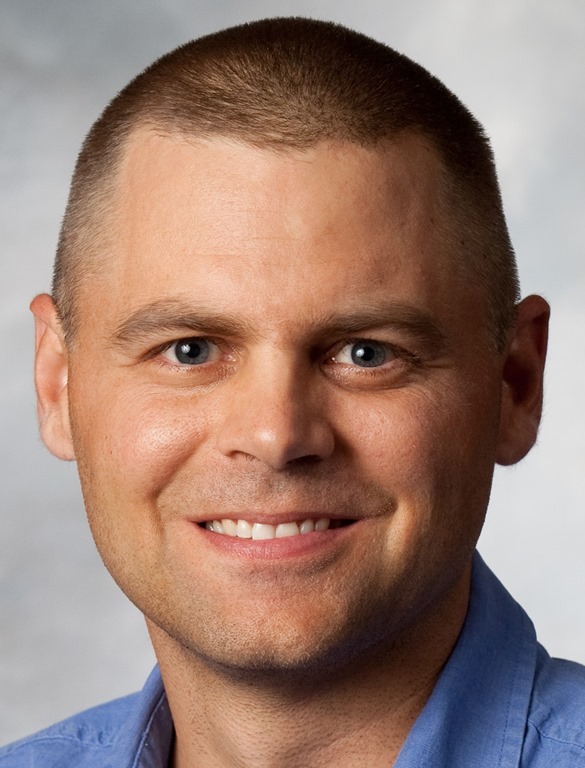 Can I go to Microsoft Convergence? Yes, please consider investing the time and money to attend. Microsoft Convergence is the premier customer conference where any one who’s anyone in the Dynamics community attend. This is a great time for students to get in front of perspective employers as well as have many learning opportunities throughout the week. Contact support@dynamicscloud.com and we can put you in touch with the Microsoft representatives who can provide guidance and discounts for students wanting to attend. See http://www.microsoft.com/en/convergence/atlanta15/#fbid=AGOm2Evqj4l for more information. 18. If I retake the course to improve my grade can I use the same book? 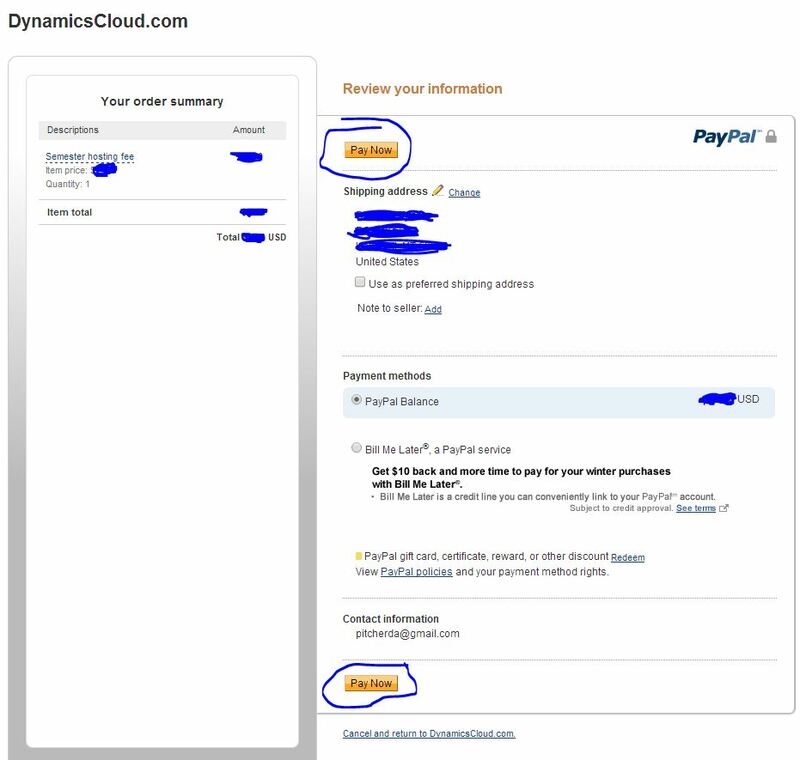 With professor approval (email from the professor is sufficient) the student can go to the DynamicsCloud website and choose the “Course Retake with Professor email” as shown in the picture below. After paying for the $30 semester hosting fee we'll send out a fresh set of credentials. It's not intended to let students sell the book however. The book publisher won't allow us to reissue hosting credentials except for the case of retaking a course. The fee is $30 for the semester and the student will be sent to a PayPal site to make the payment after filling out the course retake option. 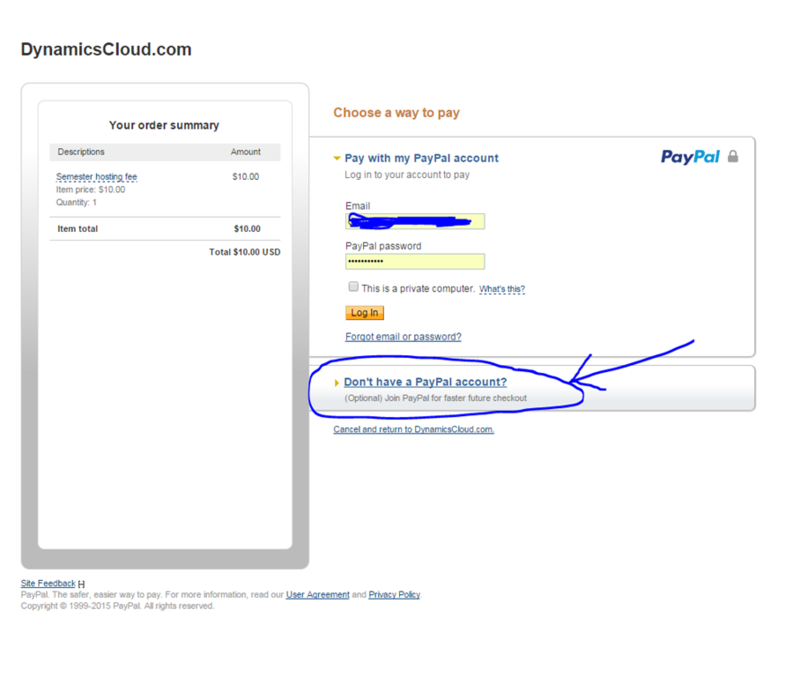 See above about paying through PayPal if you don’t have a PayPal account. There are many exciting careers focused on ERP implementation, support, consulting, and training. With the right initiative students can find Microsoft partners willing to train and mentor newly graduated students all over the country. We usually work with professors who recommend candidates and team up with partners looking to hire resources. Drop us an email with the subject “I want a Job” and include location, university you attend, and resume and we can pass your information on to hiring employers. Recommendations from professors go a long way in this pursuit. If that doesn’t work please email support@dynamicscloud.com with your user ID and university you attend and we will fix. For some actions, the Silverlight application that is used for the Microsoft Dynamics GP web client must access resources on the local machine. 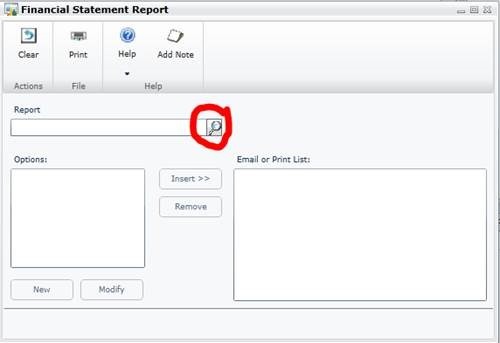 For example, when a user generates a report that uses a Microsoft Word template, the Microsoft Word document that is created must be stored locally so that it can be viewed. 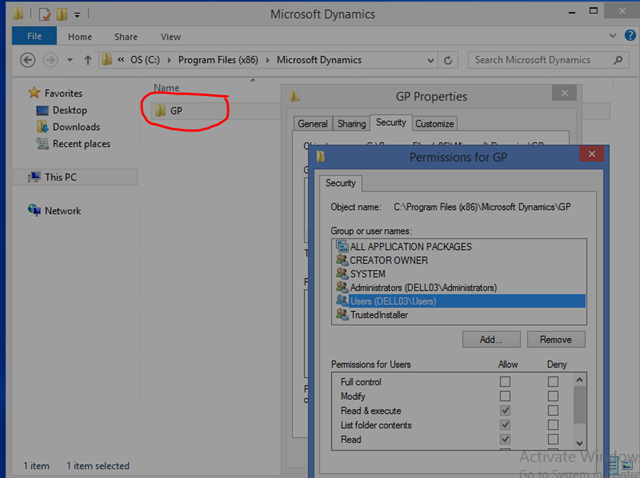 Users also need to access the local file system, such as when using the attachments feature in Microsoft Dynamics GP. By default, the Silverlight application for the web client runs in “sandboxed” mode, which restricts the access the application has to local machine resources. 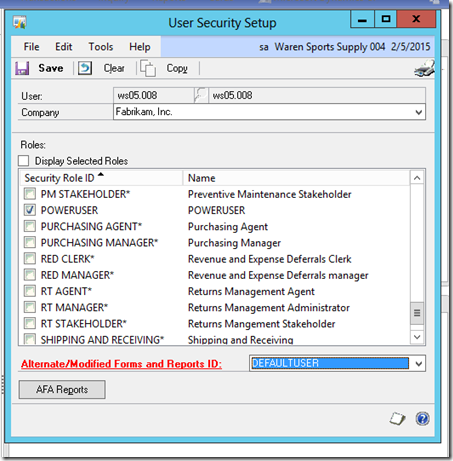 In this mode, prompts are displayed to the user each time that local resources are accessed. 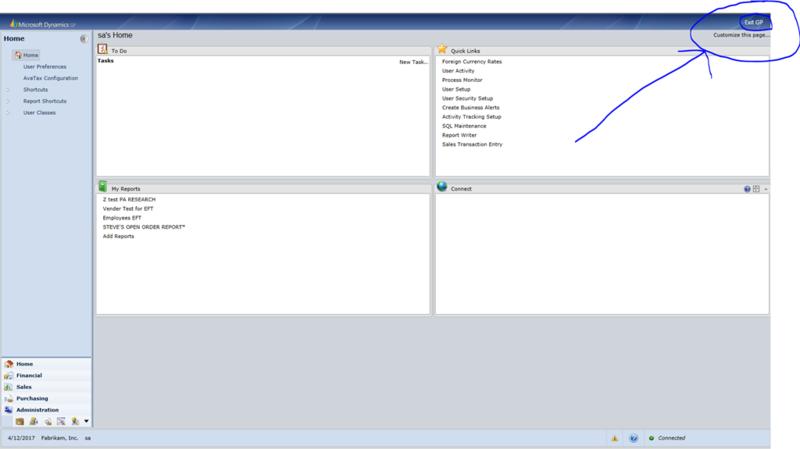 You can find out if the web client is running in sandboxed mode by looking at the status bar. If you see the padlock icon, then you are running in sandboxed mode. This is a known issue In the Web Client version we are running. 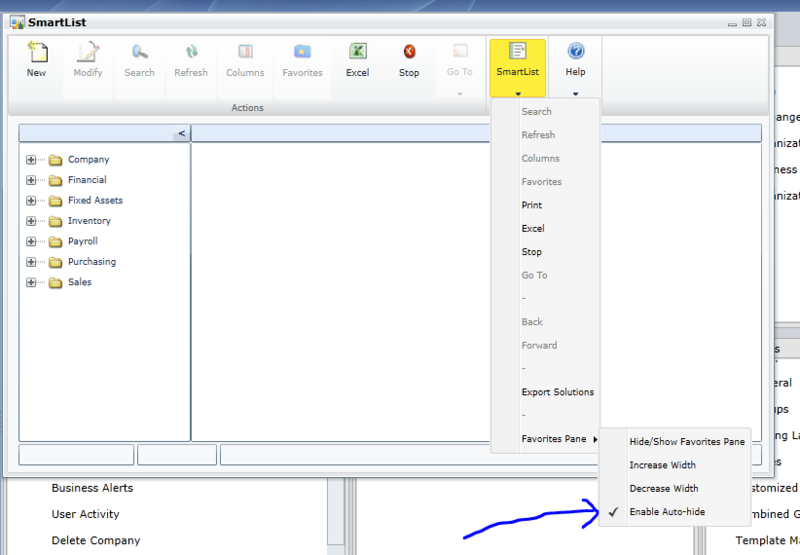 Go into Smartlist | click on Smartlist next to Help | Go to Favorite Pane | uncheck Enable Auto-hide. This FAQ sheet will be updated from time to time as other issues and questions arise. Please let us know if other issues need to be added to this list. 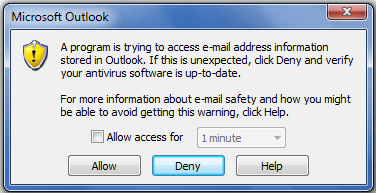 This error sometimes happens when a user is not assigned the proper security rights. 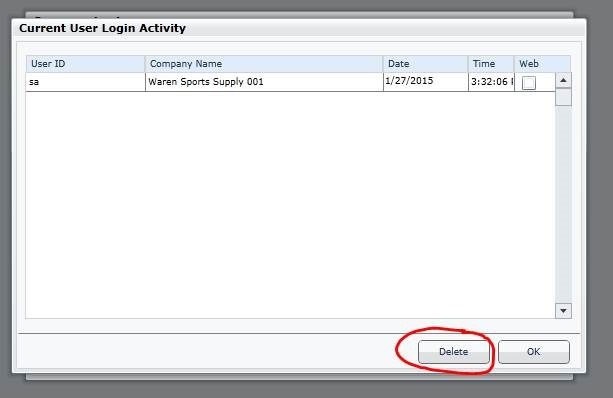 If you log into another company and go to Administration>>user security you can add the proper role and reports ID to the user as shown below. If you are not able to navigate to any of these windows you will have to contact Support@dynamicscloud.com for assistance. This might be common sense to IT people. Otherwise, this will save you a lot of headache. By now, you’ve probably clicked on Program Files (x86) a few times and wonder why you cannot give yourself Full Control security to this folder, and the answer is you cannot by design. 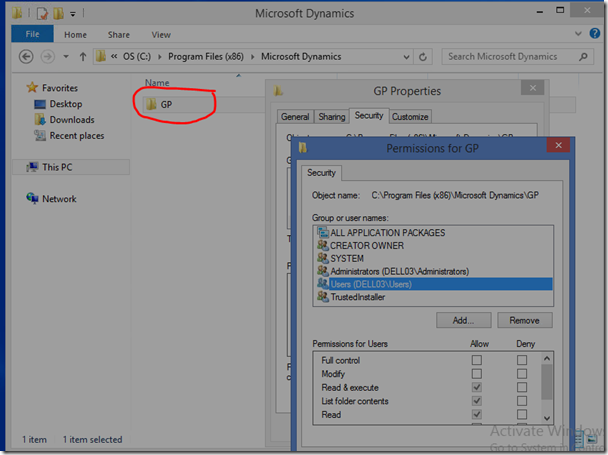 Double click on Microsoft Dynamics folder, right click on GP folder and make sure you have Full control under the security tab. This can be very frustrating when you’ve already confirmed that there are no pending transactions in the activity tables. You already cleared DEX_LOCK, DEX_SESSION, ACTIVITY, SY00800, SY00801 and it still doesn't fix the issue. I know how it feels. 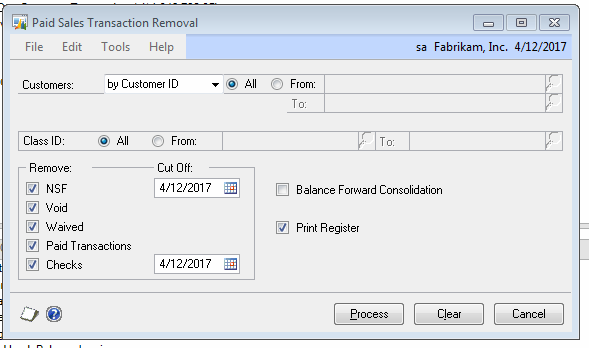 You need to run the 'Paid Transaction Removal' and “Remove Completed Purchase Orders” routine in order to move transactions to History. Nothing automatically moves to history. This routine will only move fully applied, closed and cancelled documents to history. So if you still have a balance on an invoice it stays in the Open Table. If a credit memo or receipt has not been applied to an invoice, it will stay in the Open table. 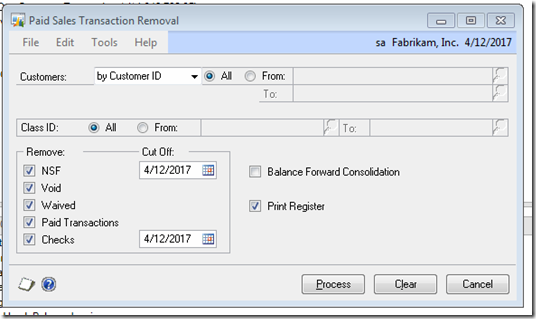 The fact that the customer's net balance is zero does not impact whether the document moves to history. 1. Make a backup 2. 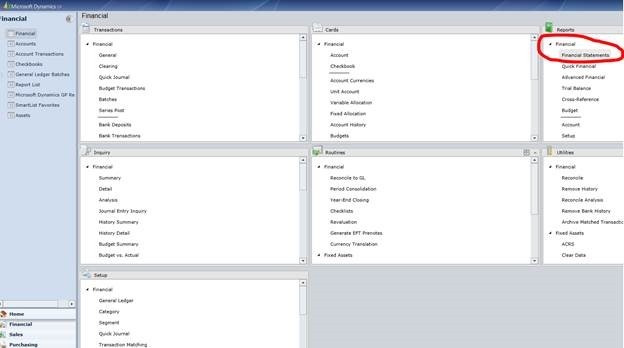 Tools>Utilities>>Sales>>Routine>Paid Transaction Removal 3. 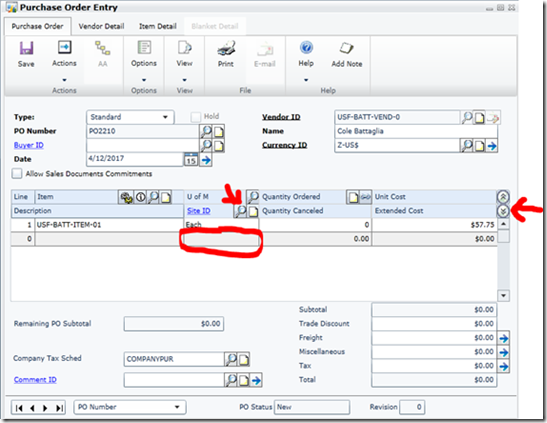 Tools>Utilities>>Purchasing>>Remove Completed Purchase Orders 4. Now you should be able to go through and change your decimal places. 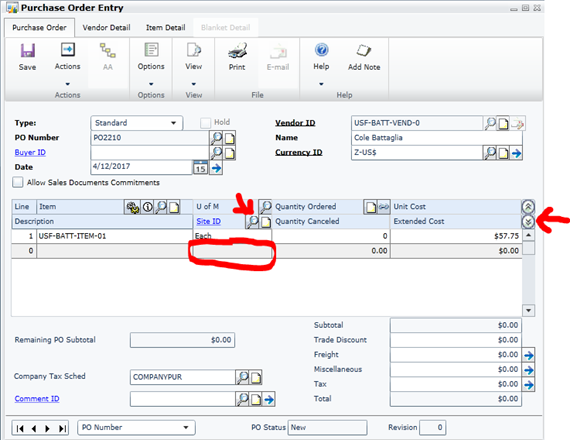 If the error still persists, then there are probably Sales documents remaining in the open table. You need to close them before they can be moved to history as shown in step #2 above. Good luck! 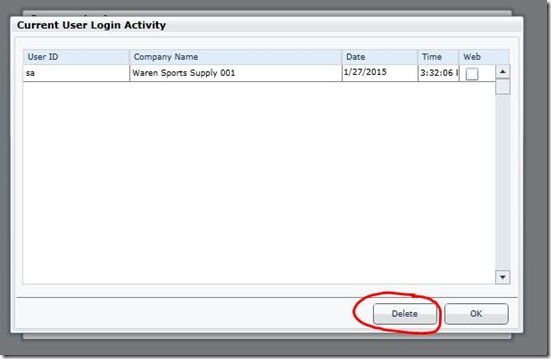 User ID __ is already logged in to company _____. Would you like to view your current logins. Click Delete to remove the current session. It'll take you back to the login window, then go ahead and click OK to log in. Email support@dynamicscloud.com for more information. 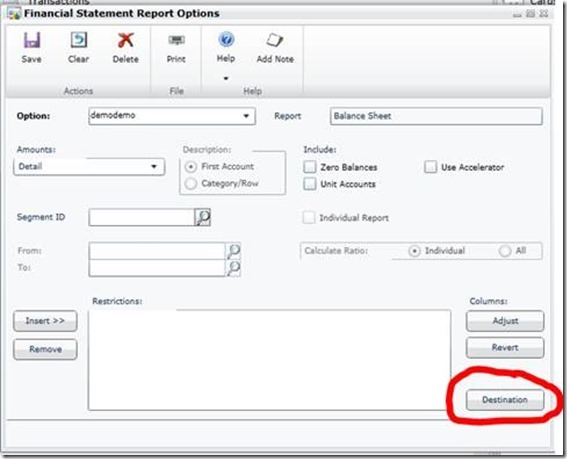 Most Dynamics GP users use Management Reporter to print financial statements. 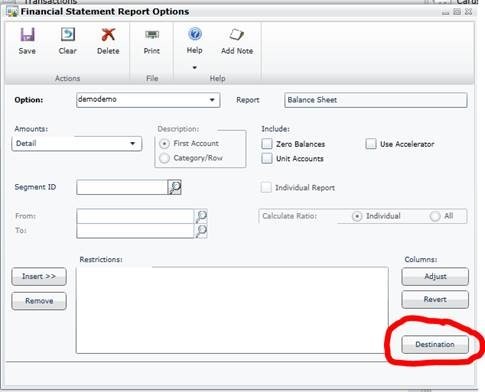 As a student using DynamicsCloud we have setup the system so you can print financial statements using a tool called Advanced Financial Analysis. 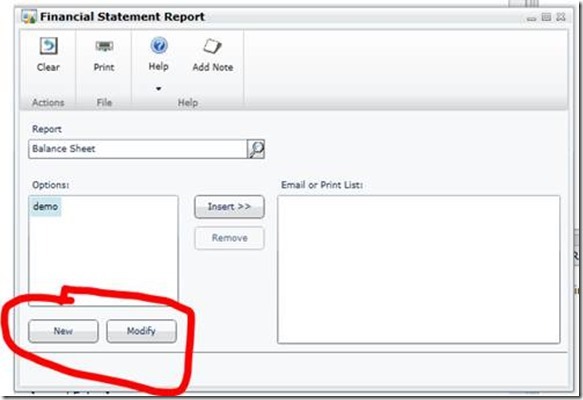 To print Financial statements you will need to make sure reports are set as a standard report as outlined below. 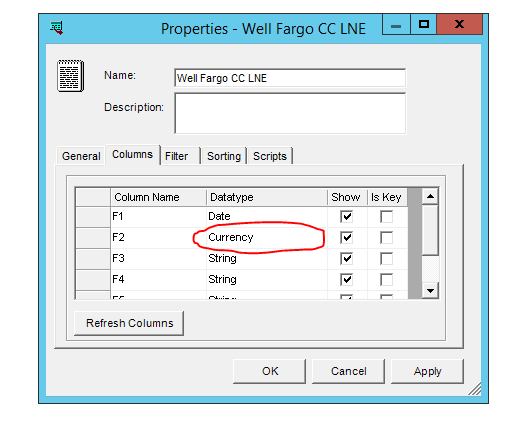 Click Modify or New to open the Financial Statement Report Options window. You can print to the Screen. 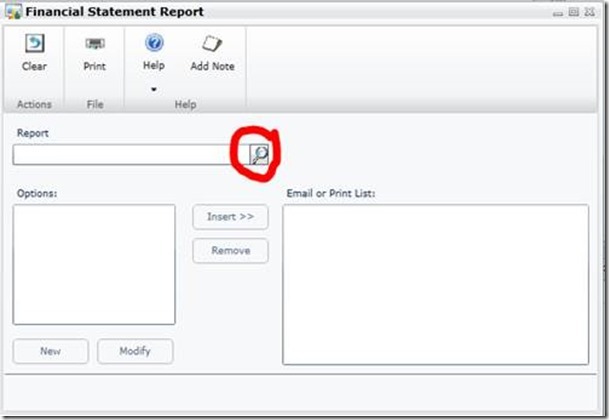 Make sure the Report Type is listed as Standard. Click OK.
Last step is to click OK. 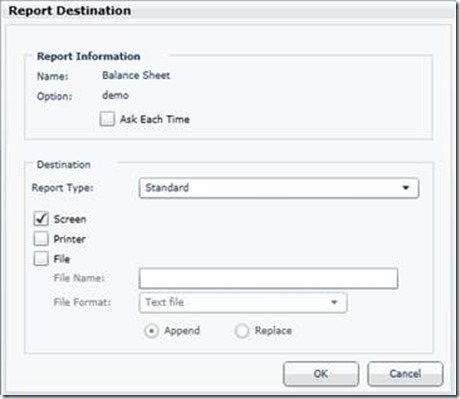 If your system errors out when trying to print you probably set the report type as Template. That is not available for this tool so it will error out. If you are looking at this post you are probably cussing and swearing about how terrible Dynamics GP is. You are also probably a student learning GP or are trying to enter PO’s or Invoices for the first time. 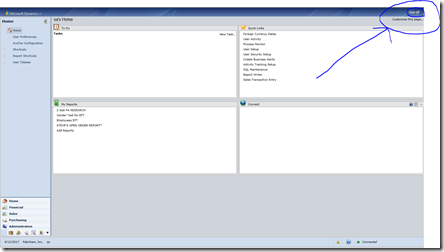 windows, go through and make sure to populate all empty fields. Believe it or not this is not a system issue. When it says not all the required fields are filled out it really means you should fill out all the required fields. I hope that helps you in your studies and if not maybe it will help you stop swearing out loud in the library. 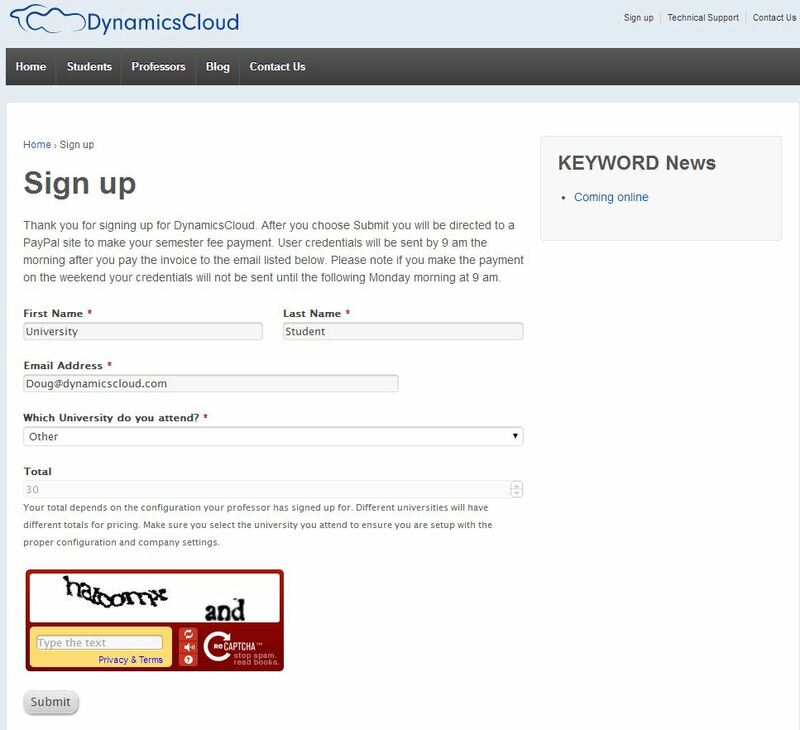 After you have signed up for DynamicsCloud you and have received your credentials you are now ready to log in to the system. This process is easy if you read these instructions. Please open an INTERNET EXPLORER browser. That's the internet browser with the IE initials. Please do not use Chrome, Firefox, or any of the other internet browsers available. Step 1. Once you've opened INTERNET EXPLORER browse to www.dynamicscloud.com and under the Student tab select Login. 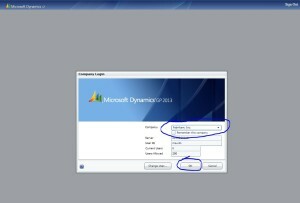 Once there you can click on the Login button which takes you to this location https://dynaa.dynamicscloud.com/GP/Views/LogOn.aspxh. Or you can just browse out and go to this location directly: https://dynaa.dynamicscloud.com/GP/Views/LogOn.aspx. Step 2. Once you are there you can fill out your user name but please remember to put the word dynamicscloud before the user name just like this: dynamicscloud\Your_user_name I'm sure you got it but just in case you didn't you put in the Your_user_name spot the user name you were give by DynamicsCloud. An example is shown below. Step 3. After signing in you will see another login prompt. This is to get into Dynamics GP. You will enter your credentials again but this time you should not put in the dynamicscloud\ part. 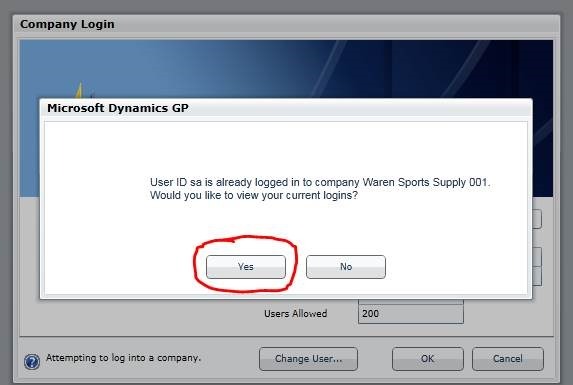 When this works you will then be asked which company you want to log in to. Choose the company you have been instructed to login to from your professor. Often it will be Fabrikam but occasionally it may be a different company. 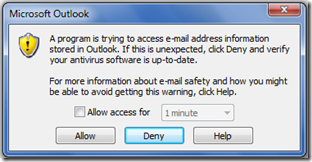 You may get this window pop up that states this is a sample company. That is supposed to happen. No worries. The first time you login you will be asked what you want your industry and role to be. You can choose whatever you want or are instructed to do. I usually choose Education and Accounting Manger. The last startup window you will see is the manufacturing window. You can choose OK with the Don't display on Startup button checked if you don't want to see it again. You are now in the system and ready to go. If you have trouble logging in please email support@dynamicscloud.com or call 858-480-7020. Hope you have a great semester. 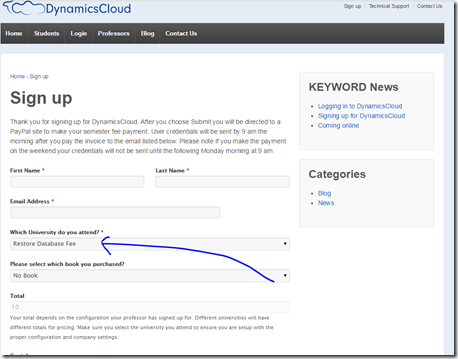 Thank you for reading this documentation on signing up for DynamicsCloud. It's amazing to find out how easy things are by reading the documentation before doing. This overview is generic but applies to most university students that have been directed to this site with the instructions to pay for your semester fee for Dynamics GP. There are three steps to this process. Step 1. 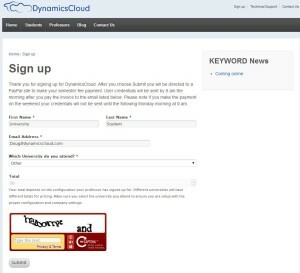 Navigate to www.DynamicsCloud.com and choose Signup or go directly there by clicking this link http://www.dynamicscloud.com/signup/ Step 2. Fill out the form with your first and last name, email address, and the university you attend. Depending on the configuration your professor has selected this will calculate the semester fee price, usually $30 per semester. NOTE: Please make sure you fill out the correct university from the university drop down list. You will be directed to that universities system when your credentials are sent. Fill out the reCaptcha field and choose Submit Step 3. 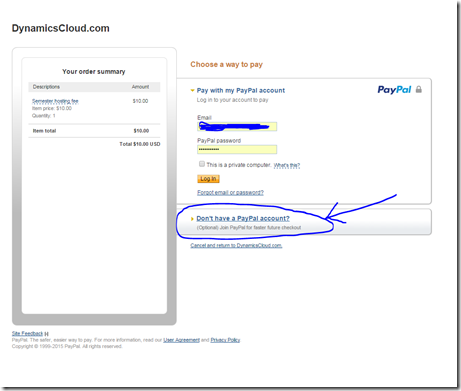 Upon clicking submit you are then directed to a PayPal site where you can pay for your semester fee. If you do not have a PayPal account you can choose this option and it will lead you through paying with a credit or debit card. 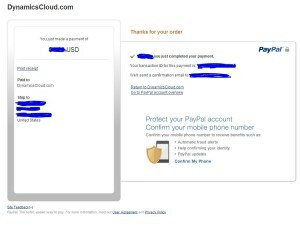 After you have made this payment DynamicsCloud will send your user credentials in a follow up email. This is not currently automatic so please be patient. You should receive your credentials by 9 am the next morning if not sooner. 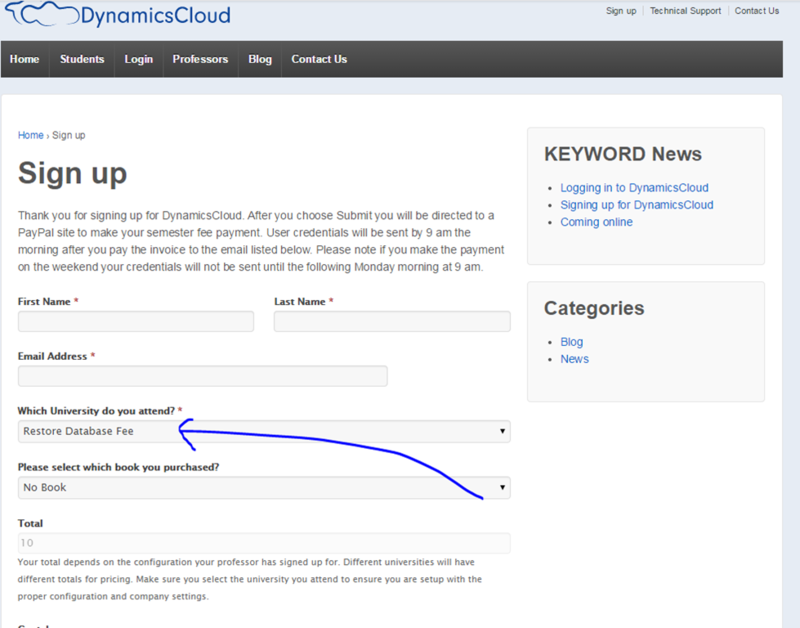 If you have questions please email support@dynamicscloud.com. 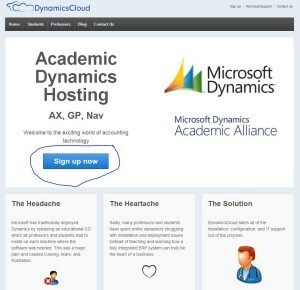 Originally we came from a well established hosting company in the Dynamics community. After several years of hosting universities with that company we decided to spin off and focus significant efforts on educational hosting. We host over 50 universities and thousands of students each year. Some of the universities we host are included below. [your-subject] [your-name] <[your-email]> From: [your-name] <[your-email]> Subject: [your-subject] Message Body: [your-message] -- This e-mail was sent from a contact form on DynamicsCloud (http://www.dynamicscloud.com) doug@dynamicscloud.com 0 [your-subject] [your-name] <[your-email]> Message Body: [your-message] -- This e-mail was sent from a contact form on DynamicsCloud (http://www.dynamicscloud.com) [your-email] 0 Your message was sent successfully. Thanks. Failed to send your message. Please try later or contact the administrator by another method. Validation errors occurred. Please confirm the fields and submit it again. Failed to send your message. Please try later or contact the administrator by another method. Please accept the terms to proceed. Please fill the required field.